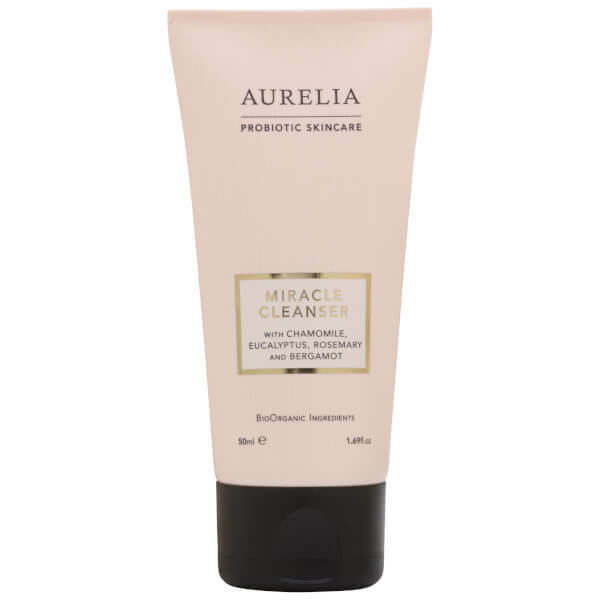 Cleanse and refine your complexion with Aurelia Probiotic Skincare Miracle Cleanser; a multi-award winning, creamy facial cleanser that works to banish impurities whilst promoting natural luminosity. Gliding effortlessly across skin, the aromatic formula infused with an invigorating blend of essential oils expertly lifts away makeup and daily build-up to leave skin feeling fresh and clean. Combining probiotic and peptide technologies with BioOrganic plant and flower essences, the intelligent cleanser delivers antioxidants, omegas and fatty acids into dehydrated skin; expect a soft, cleansed and regenerated complexion with restored hydration. Free from synthetic fragrances, colourants, parabens, mineral oils, silicones, sulphates, propylene glycol, phthalates, GMO, PEGs, TEA, DEA, MI, formaldehyde, urea, mercury, lead and bee venom. Apply the cleanser to dry skin, massage deeply with fingertips to lift daily grime and makeup away from the skin and stimulate circulation. Remove cleanser with Aurelia’s antibacterial muslin to gently exfoliate and reveal a bright, clean and glowing complexion. Ensure the cloth is warm and damp and gently sweep over the skin. *naturally occurring in essential oil.